What’s the evidence that Agile works? In my experience Agile works very well but it’s helpful to have concrete evidence to convince skeptics. 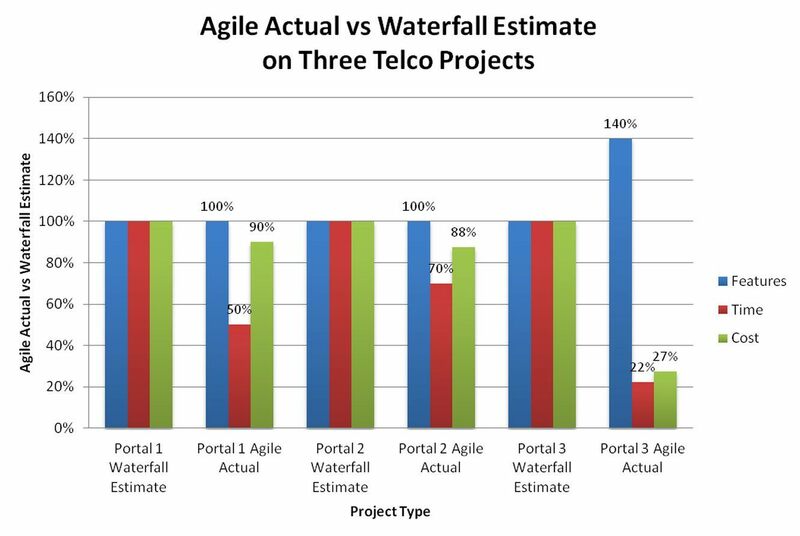 In 2007 I worked on a series of large projects for a large Telco using a heavy Prince 2 waterfall process. During this company’s multibillion dollar IT transformation program, the business and technical people became very unhappy with this approach and in 2010 the COO announced that they were going Agile. Prior to the Agile announcement my group spent nearly two years using this Prince2 methodology to deliver three large multi-million dollar projects which transformed the company’s online platform for Enterprise customers. As usual these projects took longer, cost more and delivered less than expected. After these projects were deployed, the business asked us to deliver the most important things that had been de-scoped in the next three months before they lost their remaining budget. We estimated three projects with the usual waterfall methodology and found that none of these projects could be delivered in three months. Since time was short I asked the business, the vendor and IT management to let me use an Agile approach to deliver as much as we could in the time remaining. The result was proof that Agile works. On the first portal, we delivered the features requested in 50% less time and 10% less cost than originally estimated. On the second portal we delivered the features required in 30% less time and 10% less cost than estimated with half the functionality deployed early. On the third portal we reduced the time it took to place a business order for mobile phones from 10 minutes to three minutes for 80% less than it had taken to do a similar project two years before! It’s true that some Agile coaches can be arrogant but this is a phase that most grow out of as they get more experience – I don’t meet any dogmatic coaches in agile circles these days.